BACKGROUND AND PURPOSE: We hypothesize that the nearly doubling of signal-to-noise ratio at 3.0 T compared with that at 1.5 T yields improved clinical MR angiograms and enables superior visualization of intracranial aneurysms. The goal of this study was to determine whether 3.0-T time-of-flight (TOF) MR angiography is superior to 1.5-T TOF MR angiography in the detection and characterization of intracranial aneurysms. METHODS: Fifty consecutive patients referred for MR angiography of a known or suspected intracranial aneurysm underwent 3-T TOF MR angiography. Seventeen of these 50 patients had also previously undergone 1.5-T TOF MR angiography and these images were used as a basis for comparison with images obtained at 3.0 T. Fourteen of 23 patients in whom aneurysms were identified also underwent prior conventional angiography, which was used as the reference standard. Readers blinded to patient history identified the presence and location of aneurysm(s) on angiograms and graded images for overall image quality by using a five-point scale. RESULTS: Twenty-eight aneurysms were identified in 23 of 50 patients. Seventeen aneurysms in 17 patients had been documented with 1.5-T MR angiography. The 3.0-T technique had a higher mean image quality score than that of the 1.5-T MR technique (P < .0001). Both 3.0-T and 1.5-T TOF MR angiography depicted all the aneurysms that had been documented by conventional angiography. CONCLUSION: 3D TOF MR angiography at 3 T offers superior depiction of intracranial aneurysms compared with that of 1.5-T TOF MR angiography. In the United States, the annual incidence of intracranial aneurysm detection is 11.1 per 100,000. However, the prevalence of unruptured intracranial aneurysms is considerably higher. Many aneurysms go undetected throughout life, and it is estimated that 10–15 million people in the United States have or will have an intracranial aneurysm (1). The rupture rate of unruptured intracranial aneurysms is low for small aneurysms (<7 mm), particularly when no history of subarachnoid hemorrhage from some other aneurysm exists. However the rate is considerably higher for larger (>12 mm) intracranial aneurysms in patients with no history of subarachnoid hemorrhage (2). Subarachnoid hemorrhage from rupture of an intracranial aneurysm accounts for one-fourth of all deaths related to cerebrovascular disease (3). The high morbidity and mortality of ruptured intracranial aneurysms make accurate detection and treatment of aneurysms of substantial clinical and public health importance. Intracranial aneurysms were previously identified and characterized by use of conventional cerebral angiography. However, with the development of cross-sectional imaging techniques including CT and MR, noninvasive detection and follow-up of intracranial aneurysms became possible (4, 5). The use of MR angiography and CT angiography to identify and characterize intracranial aneurysms has evolved rapidly. Early clinical studies demonstrated that aneurysms needed to be 5 mm or larger to be identified prospectively (6). With the recent development of stronger gradients allowing improved 3D time-of-flight (TOF) techniques, aneurysms less than 3 mm are now commonly identified (7). Because small aneurysms are at risk of rupture, especially in those patients with a known history of subarachnoid hemorrhage and in selected locations, accurate detection of these smaller aneurysms is important. Routine clinical MR angiography has been performed by using systems with a magnetic field strength of 1.5 T or less. In the fall of 1999, the Food and Drug Administration allowed MR units with main field strengths up to 4.0 T to be classified as nonsignificant-risk devices. To date, MR units with field strengths up to 3.0 T have received 510(k) clearance from the Food and Drug Administration. The approximate doubling of signal-to-noise ratio from 1.5 to 3.0 T can be translated into improved spatial and contrast resolution of 3.0-T MR angiography. The purpose of this study was to determine whether 3.0-T TOF is superior to 1.5-T TOF MR angiography in the detection and characterization of intracranial aneurysms. Fifty consecutive patients referred for MR angiography for suspected or known intracranial aneurysms were imaged prospectively at 3.0 T. The patients included 20 men and 30 women ranging in age from 24 to 82 years (mean age, 60 years). The MR imaging sequences included in this study were sagittal T1-weighted spin-echo (TR/TE, 600/14; field of view, 22 × 22 cm; matrix, 256 × 192), axial T2-weighted spin-echo (TR/TE, 30, 80/2200; field of view, 20 × 20 cm; matrix, 256 × 192), axial T2-weighted fast spin-echo (TR/TE, 4000/98; field of view, 24 × 24 cm; matrix, 256 × 256), and 3D TOF MR angiography. Details of the 3.0-T TOF MR angiography protocol have been previously described (8). 3.0-T imaging was performed on a VH/i system (GE Medical Systems, Milwaukee, WI) based on a 3.0T-94 actively shielded magnet (Magnex Scientific; Magnet Ltd., Oxford, UK). The system is equipped with 40mT/m gradients, a 150T/m/s available slew rate, and a 55-cm patient aperture. A single-channel, transmit-receive birdcage head coil was used. The study was conducted with patient consent and with the approval of the institutional review board. The 3.0-T TOF MR angiograms were acquired with two axial slabs of 32 sections per slab, with 1.4-mm-thick sections centered just above the M1 segment of the middle cerebral arteries. TR/TE was 38/3.4 ms. A ramped radio-frequency pulse with a central flip angle of 25° was used. The echo delay of 3.4 ms places lipids and water out of phase at 3.0 T, which reduces the lipid signal intensity. The field of view was 180 × 162 mm, and the prescribed matrix was 288 × 224. The acquisition time was 8 minutes 4 seconds. Of the 50 patients imaged at 3.0 T, 17 had known aneurysms documented on previous 1.5-T TOF MR angiograms. The mean interval between the 1.5-T and 3.0-T MR angiography examinations was 554 days (range, 19–1552). Fourteen of 23 patients in whom aneurysms had been confirmed had aneurysms documented on a previous conventional angiogram. The remaining patients imaged at 3.0 T did not undergo either previous 1.5-T MR angiography or conventional angiography. If more than one 1.5-T TOF MR angiogram was available from a patient, only the most chronologically recent examination was used for comparison with the 3.0-T MR angiogram. The 1.5-T TOF protocol only differed from the 3.0-T MR angiography protocol in that the TE was 6.9 ms and the size of the frequency-encoded matrix was 256 × 224 (8). A review was performed of the collapse and subvolume images of the 50 3.0-T and 17 1.5-T MR angiograms. Two reviewers (G.F.G., J.H.) blinded to clinical data, results of previous conventional angiograms, MR findings, and MR angiography results scored the studies. The 3.0-T TOF and 1.5-T TOF MR angiograms were evaluated for overall quality of distal vessel identification, vascular signal intensity, and motion artifact. Each examination was given a score on a five-point scale: 5 signified excellent quality; 4, more than adequate quality for diagnosis; 3, adequate quality for diagnosis; 2, less than adequate quality for diagnosis; and 1, nondiagnostic. A paired t test was used to compare differences in image quality between 3.0-T TOF and 1.5-T TOF MR angiograms. The difference between 3.0-T TOF and 1.5-T TOF scores was calculated for each patient. If a true null hypothesis is assumed, wherein no statistically significant difference in image quality between the two imaging techniques exists, the expected value of the difference between two examination types is zero. A paired t test based on this calculated difference was used to determine any statistically significant difference in image quality. Because only 17 patients underwent previous 1.5-T TOF angiography, a nonparametric paired t test, the Wilcoxon signed rank test, was used to confirm the results of the paired t test. Among the 50 patients studied, 28 aneurysms were identified in 23 patients. Prior conventional angiograms were available for comparison in 14 of these 23 patients. All 14 aneurysms seen at conventional angiography were accurately characterized by 1.5-T and 3.0-T MR angiography. 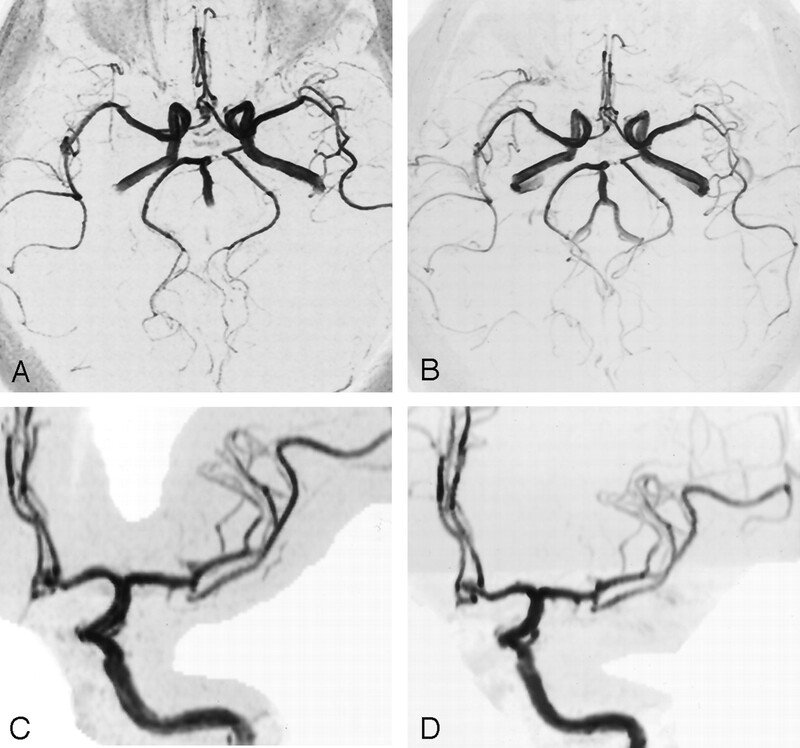 Size and configuration of aneurysms were consistently shown among all three techniques (9). Seventeen patients who had undergone previous 1.5-T TOF MR angiography were imaged at 3.0 T. In these patients, 3.0-T TOF MR angiography yielded images with a higher mean image quality than that of 1.5-T MR angiography, with values of 4.53 versus 3.94, respectively (Fig 1). A paired t test based on the difference between 3.0-T and 1.5-T scores was performed, wherein a difference of zero represented equivalent examination scores. This analysis shows 3.0-T TOF MR angiography has significantly higher image quality than that of 1.5-T TOF MR angiography (P < .0001; 95% CI = 0.47–1.17). Because of the small sample size of 1.5-T TOF MR angiograms in this group (n = 17), confirmation of this result was done by the nonparametric Wilcoxon signed rank test (P = .002). A 54-year-old woman with autosomal dominant polycystic kidney disease. A and B, 1.5-T (A) and 3.0-T (B) TOF collapsed images. The distal middle cerebral artery branches are better visualized on the 3.0T MR angiogram. C and D, Subvolume image of 1.5-T TOF MR angiogram (C) demonstrates a 3-mm superior cerebellar artery aneurysm (arrow). 3.0-T TOF MR angiogram (D) depicts the aneurysm (arrow) and the distal posterior cerebral artery branches better than the 1.5-T TOF MR angiogram. E and F, Source images of the 1.5-T (E) and 3.0-T (F) MR angiograms. The superior signal intensity and spatial resolution of the 3.0-T examination allows visualization of temporal lobe cortex and vermis of the cerebellum. 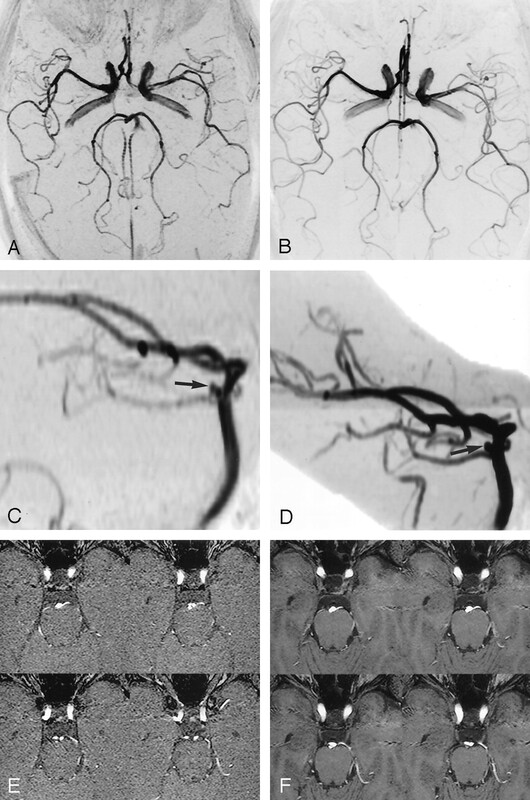 The 3.0-T TOF MR angiography technique demonstrated superior depiction of intracranial aneurysms compared with that of 1.5-T TOF MR angiography. In our sample of 14 patients who underwent conventional angiography, the frequency of detection of aneurysms by use of either 3.0-T or 1.5-T TOF MR angiography was 100%. However, our analysis showed that images generated at 3.0 T were of superior overall quality compared with those obtained at 1.5 T. Furthermore, 3.0-T TOF had better spatial resolution with better delineation of vessel walls than did 1.5-T TOF MR angiography. The 3.0-T TOF MR angiograms also had better distal vessel resolution than did those obtained at 1.5 T. For example, a 4-mm anterior communicating artery aneurysm was seen on both 3.0-T TOF and 1.5-T TOF MR angiograms; however, the aneurysm was best seen with 3.0-T TOF MR angiograms, wherein background suppression and spatial resolution surpassed that obtained at 1.5-T TOF MR angiography (Fig 2). The 3.0-T TOF demonstrates better spatial resolution and improved visualization of the distal vessels as compared with 1.5-T TOF angiography. A 64-year-old woman undergoing screening owing to a family history of aneurysms. A and B, 1.5-T (A) and 3.0-T (B) TOF collapse images. The distal middle cerebral artery branches are better visualized on the 3.0T MR angiogram. The 3.0-T TOF MR angiography technique offers improved image quality of intracranial aneurysms over that of 1.5-T TOF MR angiography. Supported by National Institutes of Health grant CA 37993–16 (S.J.R.). Accepted after revision June 25, 2003.